As software continues to ‘eat the world’ in today’s app economy, companies need to adapt to changing business models, globalization, and increasing regulatory compliance. Under pressure to support strategic business objectives, IT is rapidly embracing cloud technologies. Cloud adoption has steadily gained acceptance because it promises to help you achieve your business goals faster, more efficiently, and more cost effectively. 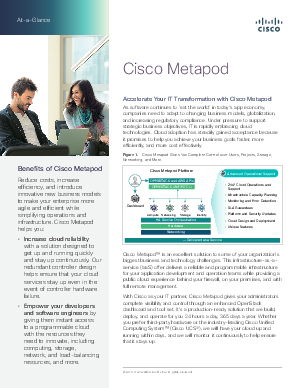 Cisco Metapod™ is an excellent solution to some of your organization’s biggest business and technology challenges. This infrastructure-as-a-service (IaaS) offer delivers a reliable and programmable infrastructure for your application development and operation teams while providing a public cloud experience behind your firewall, on your premises, and with full remote management.